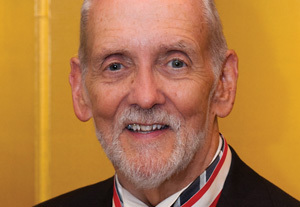 Glenn Webb, Professor Emeritus at Pepperdine and former director of the Institute for the Study of Asian Cultures, was conferred the Order of the Rising Sun by His Imperial Majesty the Emperor Akihito of Japan on November 15 in Los Angeles, California. First presented in 1875 by Emperor Meiji, the decoration is the second most prestigious after the Order of the Chrysanthemum. According to the Ministry of Foreign Affairs of Japan, Webb was selected for contributing to the advancement of Japanese studies and promoting mutual understandings and friendship between Japan and the United States.